The primary purpose of lighting system for city parks and recreation is nighttime visibility for security and safety. 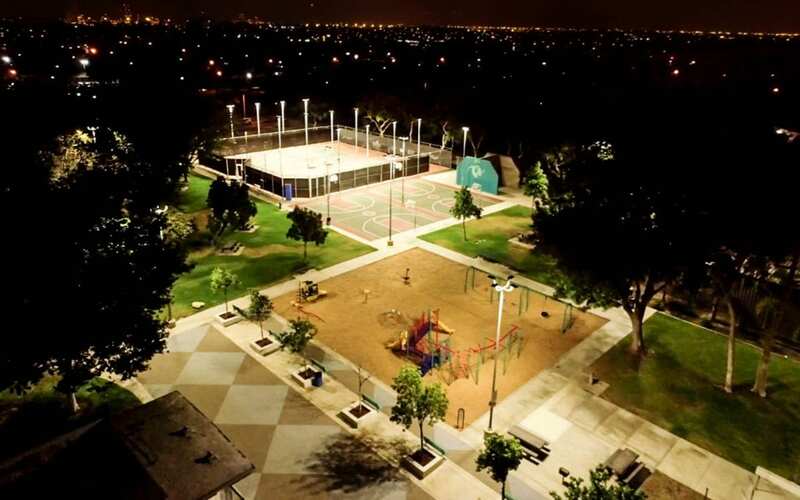 On account of that, City of Carson planned a LED lighting conversion throughout 9 parks and 4 facilities to improve illuminance as well as achieve energy savings. As part of this lighting replacement project, SolarMax LED provided 1,000 exterior fixtures for park parking lots, basketball court, tennis court, playground, area, building security etc. The replacement to LED is anticipated to save the City money in both energy costs and maintenance cost. Lighting is more than just a technical requirement, a security need, or a design element. It can be thought of and utilized in terms of how the type, placement, and wattage affect how that area is perceived and used. Fixtures at many of Carson facilities were old and inefficient; however with the new fixtures from SolarMax LED, the lighting improved and appeared to be more evenly distributed. Areas that were dark now have suitable lighting levels. Basketball courts are being used more often and kids are playing longer in the playgrounds. High-quality LEDs not only enhance the image of the city, but also increase the interaction between the citizens and the city. SolarMax LED worked with the City to ensure that Title 24 compliance was met. The fixtures featured a 7 pin receptacle allowing for dimming capability and future “smart city" applications. All the fixtures were on the DesignLights Consortium (DLC) approved rebate list. SolarMax LED was able to help City to achieve its energy saving goals including reducing its carbon footprint (reduced GHG), energy usage, electricity bill and maintenance personnel working on lighting issues. We are experienced in public lighting conversions. Providing efficient communication along with high quality products and services, SolarMax LED is your best choice for every outdoor/indoor lighting application.